Code Reader 1400 (CR1400) - USB Kit. 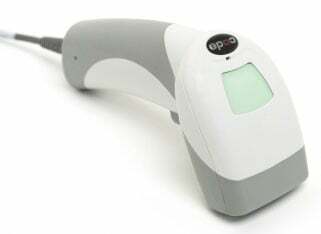 2D Imager. Includes 6 ft. straight USB cable. Color: White. The Reader 1400 (CR1400) is a compact, rugged, barcode reader that features a high performance scanning, patented dual-field optical platform and intuitive targeting that makes reading 1D and 2D barcodes extremely fast, reliable, and more affordable than ever. The innovative design of the Reader 1400 (CR1400) makes it one of the smallest, most durable barcode readers on the market today. Whether it is being used in a health care, retail, or other high-use environments, the Reader 1400 (CR1400)'s disinfectant-ready plastic housing, and IP54 rating ensures that the performance and life of the reader is never compromised by harsh cleaning agents, dust and water ingress, or even multiple drops. Applications for the Reader 1400 (CR1400) include: Health care, Mobile coupon or ticketing (event, airline, cinema, etc), Pharmacy, Patrol Vehicles, Retail, and Manufacturing. The Code CR1411-C500 is also known as COD-CR1411C500	or CR1411C500	.